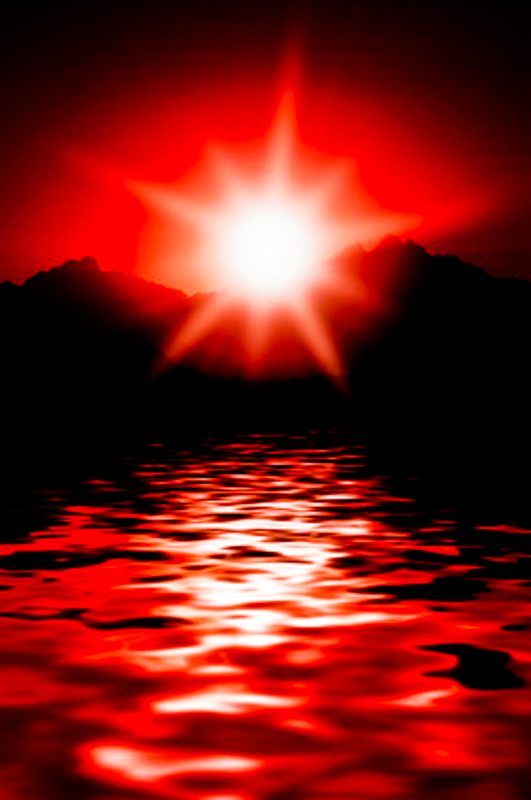 Because of the sunlight, during this particular time of the day, the water looked bloody red to Mesha and his men. Therefore having them to think that they were actually looking at real blood. During the last couple of articles, we'd learned that, after the death of Ahab's son, and successor Ahaziah. We find that Ahaziah's younger brother, Jehoram (who by the way, was the last heir from within Ahab's household) had just inherited the throne of Israel. But unfortunately for Jehoram, this also meant, he had also inherited, the current revolt that was at the time, gaining momentum from throughout the land. This was a revolt, that was being lead by Mesha, the Moabite king. Now remember, king Mesha had started this rebellion against Israel, soon after, king Ahab had met his demise. Ahab fell, as he was at the time, waging war against the Syrian king, Ben-Hadad. Now it's believed, this rebellion had came about, because Mesha refused to continue to pay the tribute, that was due to Israel. Keep in mind, this was a tribute, that had been put in place, since Ahab's forefathers. Nonetheless, this revolt that was being lead by king Mesha, placed Jehoram into an embarrassing position. This had became a situation, the new Israel king, simply couldn't ignore. And this is why we find Jehoram, wasting no time, when it came to trying to crush Mesha, and his rebels. So Jehoram went out, from within the Israel kingdom, in order to raise the largest army that he could. Also keep in mind, Jehoram wouldn't stop there, for we also find, he had sent word to Jehoshaphat, the Judean king. And it would be during this time, we find Jehoram asking the Judean king, if he would join him in his quest, when it came to helping him to crush, Mesha's rebellion. And just like he did with Ahab, Jehoshaphat would agree to help the Israel king. But on top of all of this, Jehoram would get an extra bonus as well, being that he would also gain the help, from the Edomites as well. Now I want to remind you, all of this had came about, because the Edomites at that time, we're a vassal of the Judean kingdom; and so therefore, because of this alliance, the Edom king, would automatically be drawn into this conflict, between Jehoram and Mesha's rebellion, regardless if he wanted to participate, or not. Is There A Prophet Among Us ? Nonetheless, after Jehoram and his newly formed alliance, with the Judeans, and the Edomites, had decided to venture forth, when it came to their war campaign against Mesha, and his rebels; they started heading through the Desert of Edom. But it would be during this time, all wouldn't go well; for you see, being that after they had traveled, for only three days, into the desert, the three kings unfortunately learned, they had ran out of water. And not only did running out of water, hurt the people in their camps, but the unfortunate incident, tremendously affected their livestock as well. Jehoram Starts Marching On Moab! Nonetheless, as we move forward, we now find ourselves at the point, where word had just gotten back to Mesha. For this was a report, that had informed the Moabite king, Judah and Israel, were declaring war upon them. And after reading this, the Moabites shouted: Look... over there! They're marching on Moab! And because of this, Mesha called up every male, both young and old, therefore calling up all those, who could actually bear arms. And after doing this, he ordered them to be stationed, on the southern border. However, another day would come and go, and once again, it was morning. And it would be at this time, the Moabites would see sunlight shining on the surface of the water, that had filled the ditches, the Lord had the three kings to dig, the previous day. And because of the sunlight, during this particular time of the day, the water looked bloody red to Mesha, and his men. Therefore having them thinking, they were actually looking at real blood. And because of this, they'd cried out: "That's blood! Judah and Israel, must have fought, and slaughter themselves. Now here we go, to the plunder... Moab!" So the Moabites started their advancement, and soon, they would find themselves marching into Israel's camp. However, unfortunately upon their entry, they would soon find out, Judah and Israel did not slaughter each other, after all. As a matter of fact, the opposing armies, that consisted of Judah, Israel, along with the Edomites, were to be found well rested, and very capable. Oh yes, the Moabites had found, that they had made a very crucial mistake. And because of this, Jehoram, Jehoshaphat, and the king of Edom, easily fought off the Moabites; so much so, Mesha would soon find himself, and his men, in a full retreat. So Jehoram and his allies, aggressively pursued the Moabites; destroying, and slaughtering everything, they had came across their path. Not only did the three kings, destroy all the Moabites towns; but they also threw stones, unto every good field, therefore making those fields unproductive, being that they would now be completely covered by stones. And not only this, Jehoram and his allies, dammed up every water spring, as they cut down all the good trees, from within the land. Mesha Turns to Chemosh : Please Help Us! Now when Mesha had seen, that at this point, from within the battle, defeat was inevitable. The Moabite king, begins rounding up 700 swordsmen. Mesha would use these men, so that he could try to escape. And he would attempt to do this, by going through the land of Edom. But again, much to his surprise, the Edomites would hold strong, by being able to fend off Mesha, and his 700 swordsmen. So this courageous, and successful stance, by the Edomites, ends up forcing the Moabite king, to retreat once again. Soon after this had happened, Mesha finally realized, he had been soundly defeated, by the three kings. And because of this, we now find the Moabite king, reaching out to their pagan deity Chemosh. Mesha wanted Chemosh, to help aid him in battle. So Mesha asks Chemosh this favor, by offering up his successor to the crown, which so happened to be his first born son. Mesha made this declaration, as he stood on the top, of the wall to his city. He did this, so all could see. Lo, and behold, after the Moabites had seen what Mesha had just done, they'd felt encouraged to fight on. So they became very angry, and vengeful, when it came to Jehoram, and his allies. And with this new found motivation, and inspiration, the Moabites were able to hold what little ground, they'd had left. And by doing so, this caused Jehoram, and his allies, to give up fighting, as they returned back to their homelands... victorious! Note: Now when it came to this false deity Chemosh; know that he was the main demigod, both the Moabites, and the Ammonites had worshiped. In fact, the Moabites were actually known as: "The People of Chemosh." Also, Chemosh is seen as being "the god of war." This is why, he's also seen by the Moabites, and the Ammonites, as having the reputation, of delighting in dire situations, like chaos, murder and destruction. Now that we find that Jehoram, Jehoshaphat and The Edom King have finally defeated king Mesha and his rebellion. Know that as we begin to move forward, the Sacred Record once again, turns our attention back towards the ministry of Elisha. Now who will Lord have Elisha help, this time around?